The Justice League Dark… trapped in the mystic realm of Myrra! Their jailer? 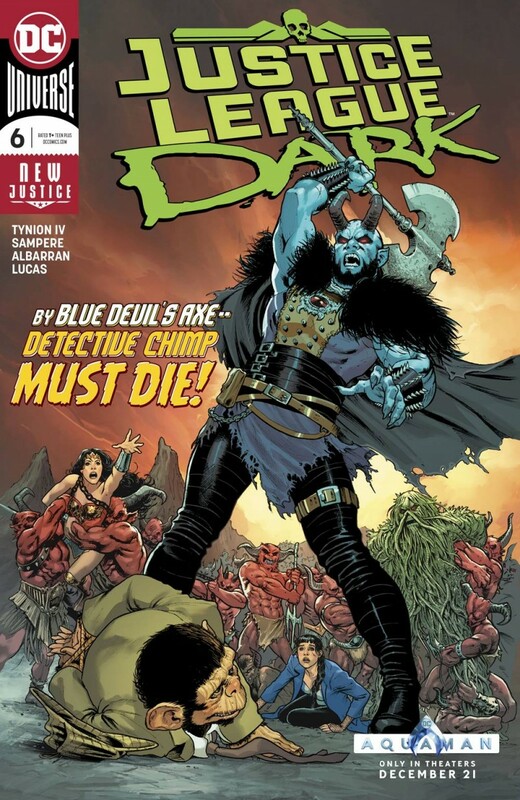 Blue Devil… and he wants revenge on Detective Chimp! Seems Bobo tried to magically resurrect his best friend, the original Nightmaster, but lost control of the spell and filled Myrra with zombies instead. And left Blue Devil behind to get eaten. So BD’s kinda sorta maybe got a reason to be pissed. With that in mind, will Wonder Woman and the rest of the JLD even step up to help Bobo against a raging Blue Devil? That sounds bananas to us.